1. 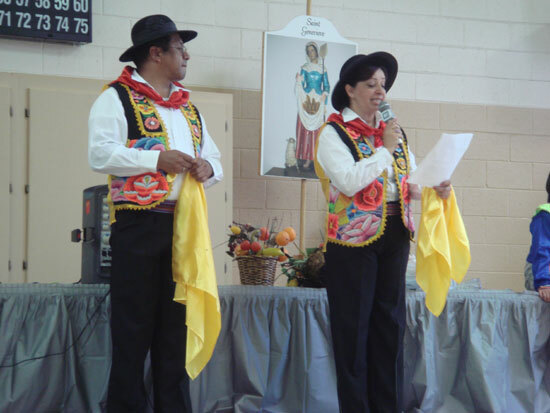 St. Genevieve Fiesta 2008 had a wonderful program which included several artists, singers, musicians and dancers. The entertainment was coordinated by Lucy Leyva. In this picture you can see the “Peruvian Dancers” explaining their culture to the public. 2. Surprise! The Blue Man showed up for a few minutes. Guess who is he! 3. The St. Genevieve Historical Society had a display called “the timeline”. 4. Beautiful faces: Lou Ann Paz and Monica Guerra. 5. The grandparents of the year: Everardo and Carmen Lopez. 7. Do you want your face painted? A flower is a good idea. 8. Many people showed interest in the history presentation. 10. “Muévete Cholita”, a dance from the Andes Mountains. 11. “Midnighters Band” gave a great concert. 12. People dancing and enjoying the fiesta. 13. NMSU Dance Sport had a wonderful presentation. 14. Mariachi Real de Chihuahua brought a lot of happiness with its performance.